List of Junk Food in Spanish | Learn Spanish Language! Junk food is a food that gives lots of calories but little nutritional value. You can find junk food all around the world nowadays. So It is very famous among the children and college student also. It important to know all Types of food in Spanish because we are learning Spanish. Junk food has also another name fast food. If you go any street then you will find many shop of junk food or fast food. So it has been very famous. There are many type of fast food available in the market as- pizza, French fries, Bacon cheeseburger etc. As we are learning Spanish then we have to know about every word in Spanish. As we have publish many article which will increase your vocabulary of Spanish as- List of objects in Spanish, List of Ordinal numbers in Spanish, How to tell time in Spanish, List of jewelry in Spanish, List of meats in Spanish etc. Like other post, today we will discuss about fast food names in Spanish or junk food in Spanish. 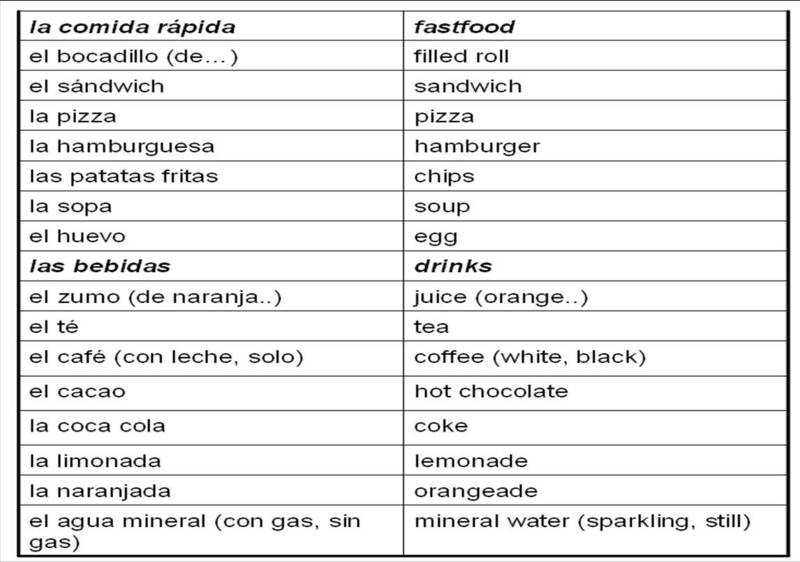 So this is the list of fast of Junk food in Spanish, you can easily learn it and also you can write it in your your Spanish vocabulary diary. We eat daily Junk food but it is injurious to health. I have given some sentence related to Junk food in Spanish below. read and try to make more sentence in Spanish. If you continue to eat too much junk food, your health will deteriorate. Si continúa comiendo demasiada basura, su salud se deteriorará. I like to order pizza. Me gusta pedir pizza. I like to eat pizza. Me gusta comer pizza. What do you like to order in Fast food? ¿Qué te gusta pedir en comida rápida? Do you like fast food or Junk food? ¿Te gusta la comida rápida o la comida chatarra? This entry was posted in Basic Spanish for Beginners, Vocabulary of Spanish language and tagged Bacon cheeseburger in Spanish, Beef burrito in Spanish, Biscuits in Spanish, Burger in Spanish, Caesar salad in Spanish, Cheesecake in Spanish, Chef's salad in Spanish, Chicken nuggets in Spanish, Churros in Spanish, Cold cut sandwich in Spanish, Crisps in Spanish, Deep fried cheese sticks in Spanish, Donuts in Spanish, Egg and sausage sandwich in Spanish, Fast food names in Spanish, Fast food vocabulary in Spanish, Fish and chips in Spanish, French fries in Spanish, Fried chicken in spanish, Hamburger chili in Spanish, Hot dog in Spanish, How do I say Bacon cheeseburger in Spanish, How do i say Biscuits in Spanish, How do I say Burger in Spanish, How do I say Caesar salad in Spanish, How do I say Chicken nuggets in Spanish, How do I say Crisps in Spanish, How do I say Deep fried cheese sticks in Spanish, How do I say Egg and sausage sandwich in Spanish, How do I say Fish and chips in Spanish, How do I say French fries in Spanish, How do I say fried chicken spanish, How do I say Hamburger chili in Spanish, How do I say Ice cream in Spanish, How do I say Milk in Spanish, How do i say Milk shake in Spanish, How do I say Nachos in Spanish, How do I say Noodles in Spanish, How do I say Pepperoni pizza in Spanish, How do I say Popcorn in Spanish, How do I say Potato chips in Spanish, How do I say Potato wedges in Spanish, How do I say Sausages in Spanish, How do i say soda in Spanish, How do I say Sweets in Spanish, How do I say Tuna melt in Spanish, How do In say Hot dog in Spanish, How do nI say Popcorn shrimp in Spanish, How do you say Bacon cheeseburger in Spanish, How do you say Biscuits in Spanish, How do You say Burger in Spanish, How do you say Caesar salad in Spanish, How do You say Cheesecake in Spanish, How do you say Chicken nuggets in Spanish, How do you say Crisps in Spanish, how do you say Deep fried cheese sticks in Spanish, How do you say Egg and sausage sandwich in Spanish, How do you say Fish and chips in Spanish, How do you say French fries in Spanish, How do You say fried chicken in Spanish, How do you say Hamburger chili in Spanish, How do you say Hot dog in Spanish, How do You say Ice cream in Spanish, How do you say Milk in Spanish, How do you say Milk shake in Spanish, How do you say Nachos in Spanish, How do You say Noodles in Spanish, How do you say Pepperoni pizza in Spanish, How do you say Popcorn in Spanish, How do you say Popcorn shrimp in Spanish, How do you say Potato chips in Spanish, How do You say Potato wedges in Spanish, How do You say Sausages in Spanish, How do you say soda in Spanish, How do You say Sweets in Spanish, How do you say Tuna melt in Spanish, How to say Bacon cheeseburger in Spanish, How to say Burger in Spanish, How to say Caesar salad in Spanish, How to say Cheesecake in Spanish, How to say Chicken nuggets in Spanish, How to say Crisps in Spanish, How to say Deep fried cheese sticks in Spanish, How to say Egg and sausage sandwich in Spanish, How to say Fish and chips in Spanish, How to say French fries in Spanish, How to say fried chicken in Spanish, How to say Hamburger chili in Spanish, How to say Hot Dog in Spanish, How to say Ice cream in Spanish, How to say Milk in Spanish, How to say Milk shake in Spanish, How to say Nachos in Spanish, How to say Noodles in Spanish, How to say Pepperoni pizza in Spanish, How to say Popcorn in Spanish, How to say Popcorn shrimp in Spanish, How to say Potato chips in Spanish, How to say Potato wedges in Spanish, How to say Sausages in Spanish, How to say Soda in Spanish, How to say Sweets in Spanish, How to say Tuna melt in Spanish, Ice cream in Spanish, Junk food names in Spanish, Junk food vocabulary in Spanish, List of Fast food in Spanish, List of Junk food in Spanish, Milk in Spanish, Milk shake in Spanish, Nachos in Spanish, Noodles in Spanish, Pancakes in Spanish, Pasta in Spanish, Pepperoni pizza in Spanish, Popcorn in Spanish, Popcorn shrimp in Spanish, Potato chips in Spanish, Potato wedges in Spanish, Sausages in Spanish, Sentence related to fast food in Spanish, Soda in Spanish, Sweets in Spanish, Taco in Spanish, Teriyaki chicken in Spanish, Tuna melt in Spanish on January 8, 2017 by satyenhacks.